Onggi An onggi is a traditional Korean earthenware vessel. They are designed scientifically and are made of environmentally-friendly materials. 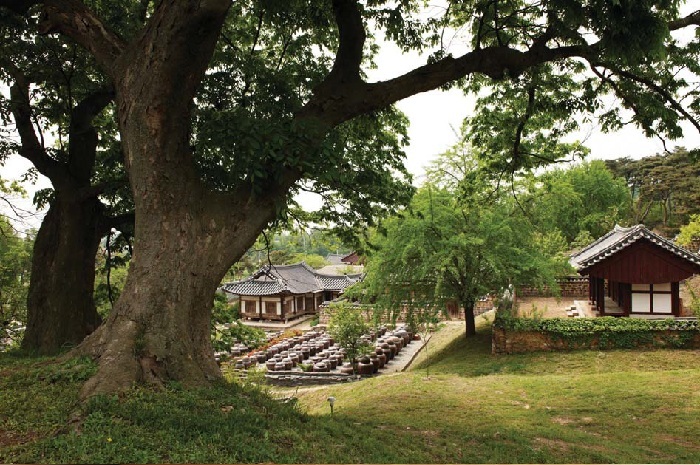 Onggi pottery has been selected as one of the 100 Cultural Symbols of Korea. This series of articles explains how to make traditional Korean pottery and how to use the large jars. We tried to use many photographs, to help readers better-understand the three core elements required when making traditional Korean pottery: the soil, the fire and the spirit. 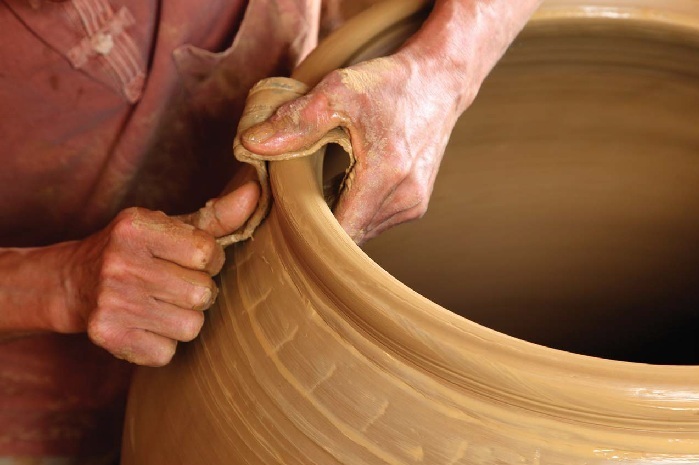 The most important of the three is the spirit, the state of mind of the Master Potter. The National Research Institute of Cultural Heritage (NRICH) will continue to publish a series of publications on Korean traditional culture, based on research carried out by staff at the NRICH. I sincerely hope that we will be able to provide valuable information to the general public and also especially for those who are interested in Korea’s intangible cultural heritage. Traditional Korean ceramics, such as the dazzling jade green celadon from the Goryeo Dynasty (918-1392), the clear, pure, white, bright porcelains and even the rather plain, yet unrestrained buncheong pottery, are all some of the most-valued artifacts from among Korea’s history of beautiful ceramics. On the other hand, onggi pottery, which has been used by families for thousands of years as common household artifacts, is not that well known. This style of pottery was alienated during the modernization process over the past few decades because onggi is an old-style, traditional container for routine daily tasks of the traditional, unelectrified household. 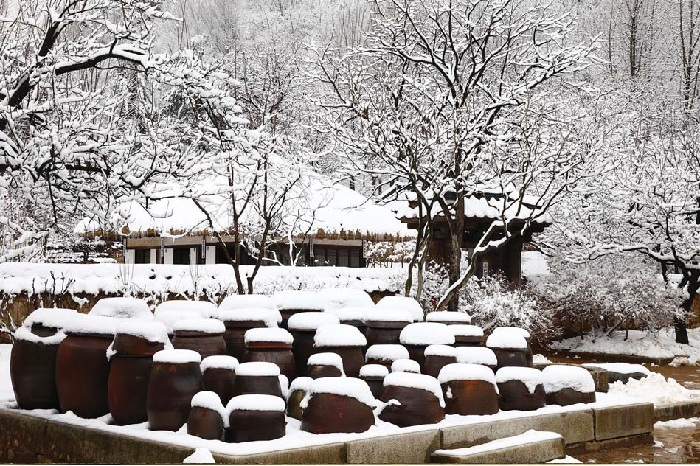 A picture of the jangdokdae, the place where a family would store its crocks and other large ceramic vessels, adjacent to a traditional home. Up until the middle of the 1970s, there was a jangdokdae in front, or on top, of each and every home. A picture of a traditional home with the jangdokdae in front of it, in Nondan, Chungcheongnam-do (South Chungcheong Province). Recently, however, people are becoming more and more concerned with nature and the environment, and once again there is a growing tendency to seek out traditional pottery, which is pollution-free and made from natural elements. A picture of a traditional home with its jangdokdae, at the Korean Folk Village in Yongin, Gyeonggi-do (Gyeonggi Province). Traditionally, onggi pottery jars were very important items in the traditional home’s daily routine and made life fuller and more comfortable as life companions. Onggi pottery is natural, a product of thousands of years of accumulated experience and wisdom. There is both glazed onggi, technically called ojigeurent in Korean, and unglazed onggi, called jilgeureut. 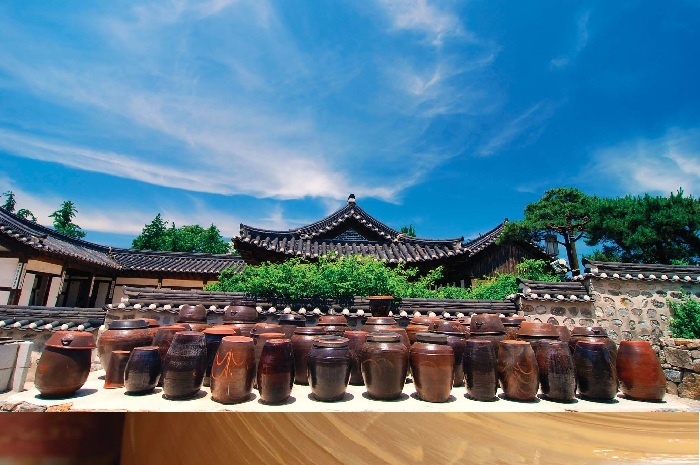 The glazed earthenware pots are used to make and store fermented foodstuffs, such as soy sauce, soy bean paste, hot pepper paste, brown bean paste, seafood, many styles of pickled vegetables and, of course, all manners of kimchi. The standard models for these pots are “dok” pots. The unglazed earthenware potteries are used for steaming rice cake, “siru” pots, and pots used as rice cookers are “baptong” pots. Just as the use of each style of pottery is different, so, too, is the method of creating each style of earthenware. The glazed earthenware is fired in a kiln. The air and fire enter into the kiln and the oxidizing flame creates “breathing” pottery. Such glazed pottery is suitable for outdoor storage containers for fermented foodstuffs. To make unglazed earthenware, the potteries are fired in a kiln, as well, but once the oxygen-fed fire gets to a certain, high temperature, the potter would feed the fire with a heavy dose of pine wood and block the chimney holes, cutting off the air supply. In this manner, the resultant pottery is completely covered with a black soot but is not fully oxidized. Such unglazed pottery is used to purify foodstuffs, balancing the humidity and “breathing” more than glazed potteries. Unglazed pottery is generally used indoors. As mentioned, onggi pottery is made from natural materials and is crafted with thousands of years of accumulated experience and wisdom. Its features may be plain and utilitarian, but in their daily use as food containers, one gets a sense of acceptance, genuine goodness and generosity. There is no standard model for onggi pottery, and many individual potters try to mingle their onggi designs with the surrounding nature, believing that their creations fit in with the mountains, wind and even the clouds. To this day, many hold that traditional onggi pottery is filled with the essence of nature and, because of their undemanding, homely appearance, bring a feeling of comfort and satisfaction to those who use the pottery on a daily basis. 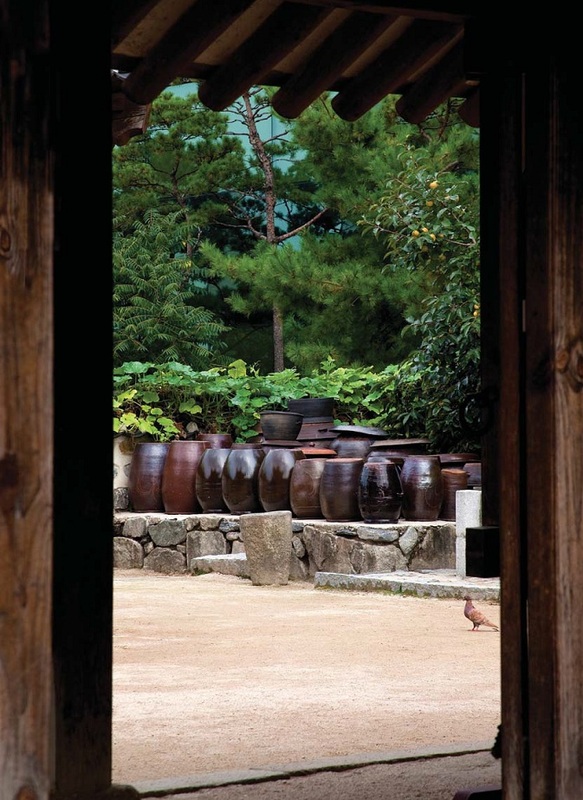 A glimpse into the traditional home, with its jangdokdae filled with onggi pottery urns. I think Korean food requires lots of efforts in the process not only of making but also of preserving it. That’s why Korean food has its unique flavor which cannot easily be found in any other countries’ food even with similar ingredients. where can you buy an onggi in Toronto GTA? I think you can go to Galleria Supermarket which is a big Korean supermarket in York mills area.